Many new stamp collectors today may not know which country the CCCP stamps belonged to as it has been decades since the collapse of USSR, the Union of Socialist Republics, emergence of many countries known today as the CAR countries and of course the lone Russia. Deprived of all the Baltic republics that the USSR usurped, the once mighty USSR is now reduced to plain Russia. USSR was essentially a Eurasian socialist state that existed between 1922-1991 before its disintegration into many CARs and what finally remained of it as Russia. The USSR was since 1956 a one unit of 15 republics, most of which fought fro their long independence from the USSR and finally got the status of their original independent status prior to amalgamation into the USSR. My stamp album contains stamps only of the CCCP and not of Russia (that is post 1991 era). In fact all stamps are up to 1975, when finally my active stamp collection came to an end. 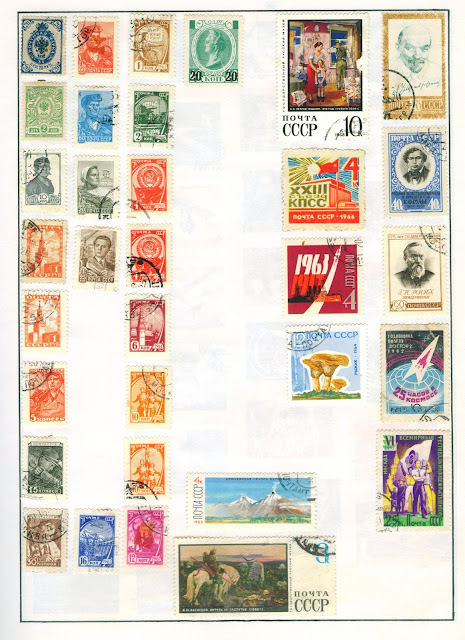 A page of the CCCP stamps is as shared above. I will add more pages of CCCP stamps in time.